Half sheet movie poster from Jacques Tourneur's noir masterpiece OUT OF THE PAST starring Robert Mitchum, Jane Greer and Kirk Douglas. Folded; good condition (some wear in folds, edge-wear). 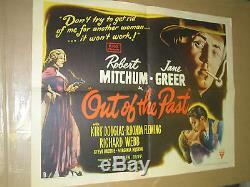 The item "OUT OF THE PAST/ ORIGINAL U. HALF-SHEET MOVIE POSTER (ROBERT MITCHUM)" is in sale since Wednesday, March 2, 2016. This item is in the category "Entertainment Memorabilia\Movie Memorabilia\Posters\Originals-United States\1940-49". The seller is "jomms" and is located in New York, New York. This item can be shipped worldwide.